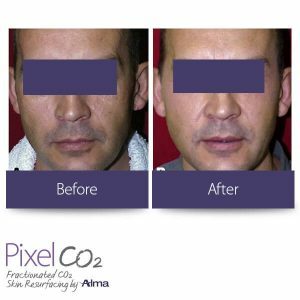 Xanadu Med Spa in Fort Collins offers fractional CO2 laser skin resurfacing treatments for Northern Colorado. This is an advanced, non-invasive way to achieve smoother, healthier, and younger looking skin. 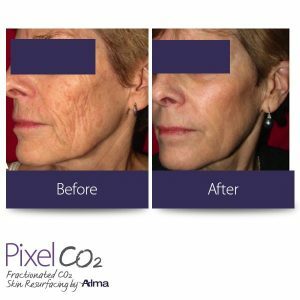 Pixel Perfect™ is a revolutionary skin resurfacing treatment from Alma Lasers that offers you the chance to look younger and let your inner radiance be free. A highly effective way to reduce wrinkles, scars, and other imperfections, laser skin resurfacing generally involves removing the damaged outer layer of the skin. In this way, it promotes collagen production and encourages the skin to replenish itself from the inside out, revealing a smooth and blemish-free appearance. The earliest forms of laser resurfacing were very effective – but they caused a lot of damage to the skin. After undergoing traditional laser resurfacing, individuals had to face significant downtime and discomfort before their new complexion could emerge. With the fractional CO2 laser, all of the benefits of traditional laser resurfacing remain – without the downsides. It’s a much gentler way to rejuvenate the skin and achieve a more beautiful appearance. Pixel Perfect™ works by creating thousands of microscopic perforations while leaving the surrounding tissue intact. This allows for very rapid healing. Pixel Perfect™ technology delivers the laser’s therapeutic energy fast, shortening your treatment time without sacrificing its benefits.